Come on, admit it. You've always wanted to have Scotty beam you up to the USS Enterprise. But it's unlikely that you will be teleported anywhere in this lifetime… unless you're a photon. And that could mean more secure communications in the foreseeable future. A group of physicists announced this week that they have successfully teleported a photon, which is a particle of light, over the span of just more than 3.5 miles in a straight length of fiber optic cable. The effort, funded by the Defense Advanced Research Projects Agency, or DARPA, sets a world record for distance in quantum teleportation. "Such a network will enable secure communication without having to worry about eavesdropping, and allow distant quantum computers to connect," said Wolfgang Tittel, in a statement. Tittel is a professor in the Department of Physics and Astronomy at the University of Calgary, where the research was done. The teleportation demonstration was conducted in the City of Calgary, using its fiber optic cable infrastructure. Tittel said he's hopeful that we’re only a little more than 10 years away from using quantum teleportation for online communications. And that will be a very good thing for people interested in keeping their messages secure. "What we need for secure communications over any channel is encryption," Tittel told Computerworld in an interview. "The way this is done today is based on mathematical algorithms. We believe that for a computer it takes thousands of years to decrypt this, but a quantum computer would be able to decrypt these things much more rapidly -- like in seconds instead of thousands of years." That means when quantum computers actually hit the market, which Tittel predicts will be in 10 to 20 years, our encrypted transmissions might not be so secure. That's where quantum teleportation comes in. With this technology, computers could imprint information or an encryption key on a photon, much like we print letters on paper, and then teleport it to the recipient. The security piece: If someone tries to eavesdrop on that photon while it's being transmitted, the information on it automatically changes -- for both the eavesdropper and the intended recipient. "It's a fundamental quantum law that we don’t have in the traditional world of physics -- the no-copying theory," said Tittel. "In the quantum world, perfect copying is not possible. It means if you receive photons from me and you see the code keys have been changed, you can conclude that someone tried to steal information. If you see the key hasn’t been changed, then nobody has tampered with the transmission." This technology already exists today in a limited fashion. 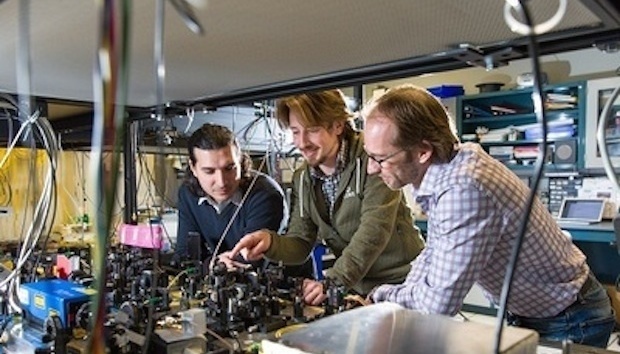 The Geneva, Switzerland-based company ID Quantique offers quantum-safe crypto technology. And a similar experiment about quantum encryption was recently conducted in China. Today, though, the technology is restricted in terms of the distance that the quantum-secured information can be sent -- only about 62 miles. "We could send secret keys inside the city but not much further," explained Tittel. "Not across Canada, for instance, and not between big cities." In the future, no distance would be too far for quantum teleportation, he added. Tittel's experiment was based on the theory of the entanglement property of quantum mechanics, which is a highly complex and mysterious branch of physics. With entanglement, two objects, even if they are not physically connected or even close to each other, communicate and interact with each other. "Being entangled means that the two photons that form an entangled pair have properties that are linked regardless of how far the two are separated," said Tittel, in the written statement. "When one of the photons was sent over to City Hall, it remained entangled with the photon that stayed at the University of Calgary." Tittel explained that one other technology that needs to be advanced to create a true quantum network is quantum memory for light, which is much like a hard disk for quantum states. Right now they exist only in laboratories. "Our goal or next steps would be to improve quantum memory, quantum teleportation and then build a quantum network across Calgary and then across Edmonton and then across Alberta," said Tittel. "We’ll have this way of communicating before we have readily available quantum computers that can easily break encryption." So what about teleporting humans, instead of just photons? Are we close to the image we have in our heads from Star Trek? The short answer, according to Tittel, is no.